Indulge in a unique insight into a French country cuisine. Enjoy the real taste of the food culture of Normandy, l' art de vivre la française. Try out some new recipes, learn a little and share the passion for cooking while spending some time in the relaxed ambiance of an 18th century farmhouse kitchen. The moment you enter, you will feel the warm welcome of open-hearted people. A gastronomic delight and a wonderful sharing of French tastes and cultures. This is definitely a beautiful holiday experience that you will not get anywhere else! Families are very welcome. The 18th century property, La Blonderie, offers two stylish bedrooms, both with ensuite bathrooms as well as a self-catering apartment. La Porte Bleue is situated on the ground floor and has its own front door and patio. Equipped with a kitchenette with microwave oven, hob, extractor fan, fridge, sink, and dishes for two people as well as a dining area, La Porte Bleue may be rented on a weekly basis for one / two people. The romantic Maid's Quarters' is located on the first floor, also with its own front door at the top of a granite stairs, typical of the area. It has a double bed and ensuite bathroom as well as a mezzanine area with a single bed - little house on the Prairie may well spring to mind! The quarters are equipped with tea and coffee-making facilities, hairdryers, and have free Internet access. Le Fenil is a two-bedroom apartment where four people can sleep comfortably (there is a possibility to rent an additional guest room in the same building, perfect for larger groups). This living quarter is equipped with Wi-Fi, TV, DVD, dishwasher, washing machine, microwave, barbeque, picnic table and so on. La Blonderie is perfectly located for exploring Normandy with its D-Day beaches and museums, Bayeux, Le Mont St. Michel, and much more. Sunday afternoon arrival at La Blonderie. Time to relax a little and explore your surroundings. A first taste of Normandy follows for Sunday night supper in the form of a Norman cheeseboard with salad, crusty bread, pastries, and wine or some locally produced organic cider. While you enjoy your food, youll also meet with your fellow cooks - a perfect introduction to the course. 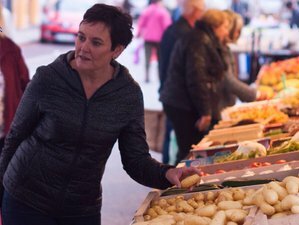 09:00 Off to Bricquebec, a beautiful medieval town, for the weekly market where youll absorb the ambience, pick up some fresh produce for your lunch and sample whatever youre offered before your first cookery session. 15:30 pm Visit to Le Pre Mahieu Ciderie where the best of Normandys organic apples are transformed into the most delicious drinks in the forms of cider, pommeau, calvados and apple juice. After a guided tour of the distillary and a walk up to the orchards (weather permitting), you will sample the various ciders, calvados, pommeau, and apple juice. Evening free restaurant recommendations and reservations are made for you where necessary. Discover the best of Normandy with its rugged coastlines, historical sites, museums, gardens, beaches, villages, and much more. Sinad will share her extensive knowledge of the area ensuring that your trip to Normandy is a truly memorable one. Explore at your ease, armed with maps, ideas, and restaurant reservations. 10:30 Food preparation Serious food prepartaion is required for the final cookery (and history) class. Vegetables will be prepared, pork loin will be prepared into Orloff, starters discussed and decided upon and whatever else is necessary for the unique foodie adventure which follows. 15:00 Excursion number 3, a full meal is prepared and cooked in an authentic post-revolution (1789) boulangerie oven (bread oven) chez Franois at La Ferme Auberge. While waiting for bread to rise and the food to cook, Franois will give a talk on the history of the boulangerie and provide lots of anecdotes for a fun-filled, educational afternoon over a glass of his home made apple juice or cider a serious treat for lovers of history, terroir and food. Same as day three, you may decide to chill out or explore the area. Whatever the case Sinad will certainly help you make the most of your stay in Lower Normandy. Suggested afternoon visit to La Maison du Biscuit, picerie fine where some last minute gifts and souvenirs may be purchased. Irish-born Sinead Wilde Allart studied Home Economics and taught it for a few years before meeting Belgian-born Philippe and moving with him to France. Her time in France has enabled her to add to her culinary repertoire enormously while learning how to speak French, raise chickens and daughters, renovate old houses, fight with local builders, ride a horse, and sing a little opera. Sinead opened the doors of her farmhouse kitchen in 2006. Sineads idea is to share l'art de vivre à la française. Explore the magic of Normandy, with its rolling green countryside, sandy beaches, historical monuments and museums and renowned gastronomy. A visit to Normandy is an experience that one never forgets. Luminous greens dominate the countrys breathtaking landscapes, while magnificent sites and monuments abound throughout. Mild winters and warm summers define the climate here, which generally experiences a lack of temperature extremes. There truly is something for everyone, ranging from historic monuments and museums, vibrant towns, beautiful chteaux, spectacular gardens and lots of activities. Make Benoistville your base and stay in our self-catering apartment, studio apartment on the grounds of our 18th century farmhouse, or in one of our stylish guest rooms (B+B) and explore this hidden treasure of France's beautiful North west. Combine cooking with history. Only 44 kilometers from Sainte Mre Eglise, immortalized in the movie "The Longest Day", 90 kilometers from Omaha Beach and the US Cemetery, and 13 kilometers from Pegasus Bridge, Wilde Kitchen is perfectly located for exploring Normandy with its World War II museums, beaches, monuments and much more. Le Mont Saint Michel, the second most visited tourist spot in France, (the Eiffel Tower is the first) is a mere 146 kilometers from your bed and breakfast inn, along the spectacular coastal road, known locally as "la touristique." While Bayeux, famous for its almost 1000-year old, world-famous tapestry, depicting the defeat of England by William at the Battle of Hastings in 1066, is 99 kilometers away - all potential day-trips. You also visit La Maison du Biscuit, epicerie fine where some gifts and souvenirs may be purchased. The Wilde Kitchen is where you'll learn to cook with Sinéad the French way, where the best of Norman cuisine is always on the menu during your cooking holiday. This holiday is available all year round on demand and may be talior-made to suit your requirements (longer/shorter/child-friendly/special diet etc.) Ideal arrival days are Sunday evenings or Tuesdays evenings because of the visit of local farmer’s market.